Let’s talk about buttercream. Nothing gets my goat more than frosting masquerading as buttercream. They are not created equal. Frosting is made of powdered sugar and butter. It’s also super sweet and gets that crust when it sits out. Ick. Buttercream is light, creamy, mildly sweet and absolutely dreamy. And it can be flavored in an infinite number of ways i.e. fruit puree, jam, melted chocolate, nuts, and on and on. Its stores incredibly well, in the fridge and freezer for months! Frosting definitely does not have that kind of shelf life. Why then does most every bakery and supermarket use frosting instead of buttercream? Laziness, cost, consistency. None of which seem to be justifiable reasons. It is possible to make it quickly, inexpensively and consistently at home, or at a bakery. At first glance, it may seem complex, but it’s actually quite simple. The first time might be a bit chaotic, but persevere! It will be easier than you thought. There are three types of buttercream, but today I’ll focus on the meringue-based variety. Once you have a taste for it, you’ll never go back. Oh, and by the way, I’ve gone metric for those following outside the states. Okay, let’s get started. First, time to prepare our tools. Making buttercream consists of two main tasks, the meringue and cooking the sugar, and these occur simultaneously. So it’s important to have all of your ingredients and tools ready before you start. *All equipment should be SUPER clean. 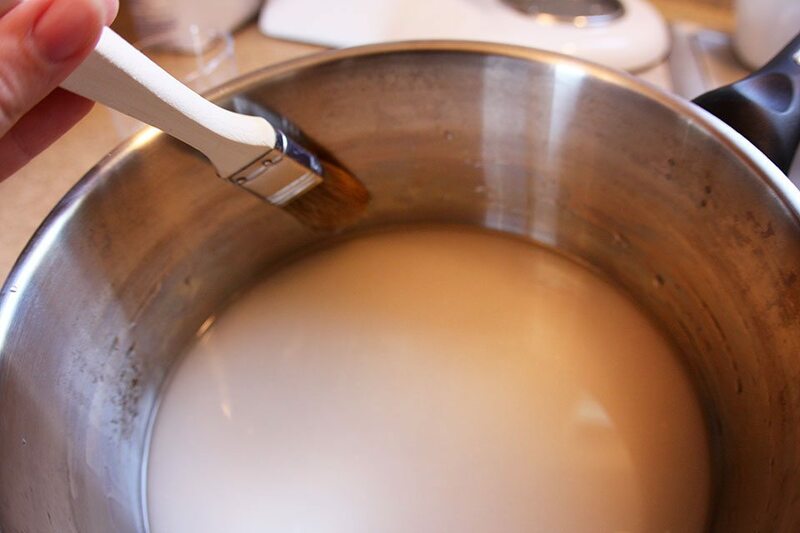 Put egg whites and cream of tartar OR lemon juice in the bowl of your mixer. (Tartar/lemon are acids. Acid helps the whites build a strong meringue i.e. light and fluffy.) It’s important when making a meringue that there are no yolks present in the whites. 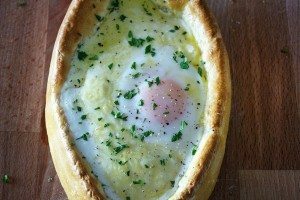 Yolks are fat, and fats prevent the meringue from rising. Start mixer on #3, low to medium mix. Put large amount of sugar in sauce pan along with enough water to make it the consistency of wet sand. Stir to ensure all sugar is wet. You will see granules of sugar that have climbed up the side of the pot. 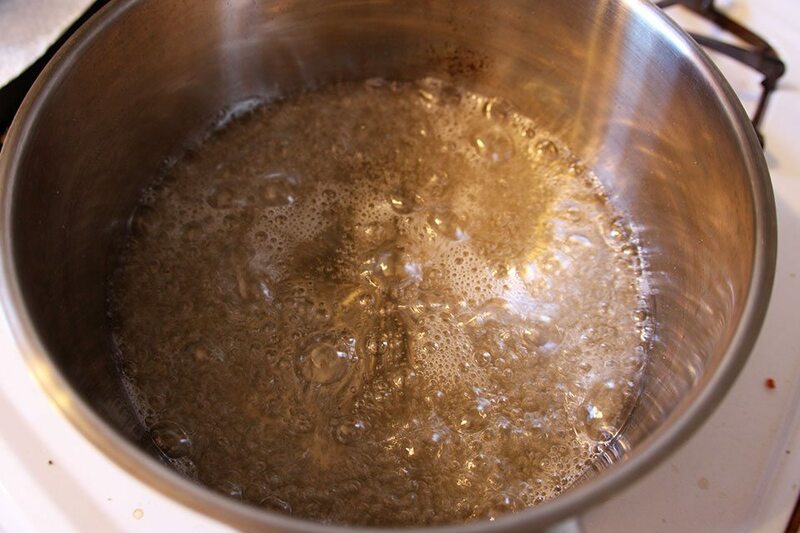 Wash this sugar down with your pastry brush (or a wet hand) so they do not come above the water line. These granules will not melt with the rest of the sugar and could cause your boiling sugar to crystallize into a big sugar mass. Heat sugar on high. Stir gently to help it melt evenly. Once it starts boiling, stop stirring. Insert your candy thermometer at this point. Now, we’ll focus on the meringue. Combine the small amount of sugar with the salt. Once the egg whites become foamy, increase speed to #4 and slowly add the sugar/salt mix a couple spoonfuls at a time. Once all your sugar is added, increase speed to #6. Now go back to your boiling sugar. Cook to 228F. When the boiling starts to slow, it’s close (By the time you add it to your whites it will be at 230F, which is ideal.) Be careful not to cook sugar past 230F. 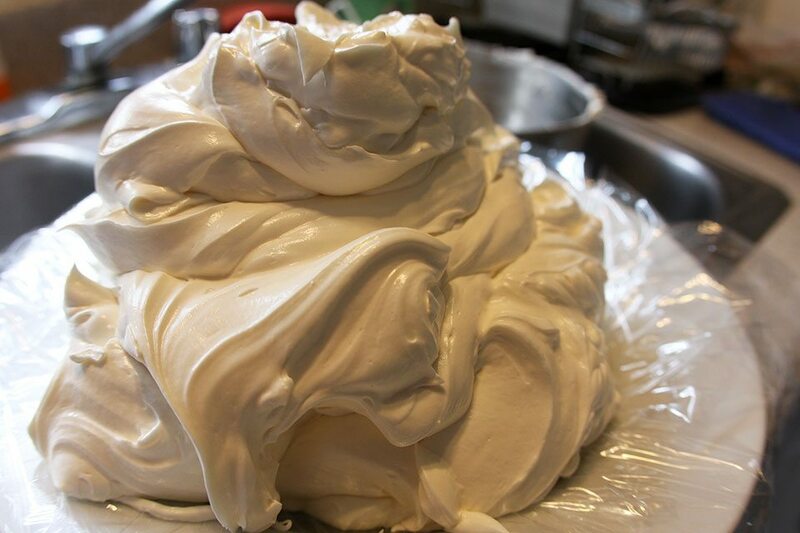 By now your egg whites should have created a nice shiny meringue. Not to worry: If your sugar is going faster than your meringue, turn down the heat on the sugar. 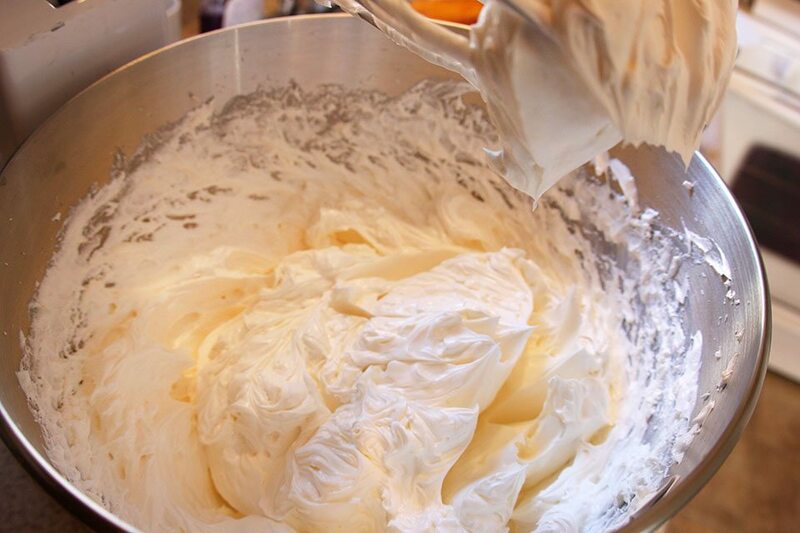 If your meringue is waiting on your sugar, turn down the mixer. Turn mixer on high and SLOWLY pour boiling sugar into the mixer while it is whipping. The easiest way is to drizzle the sugar down the side of the bowl. Don’t pour it onto the whisk or it will throw the sugar up on the side of the bowl and not into your meringue. 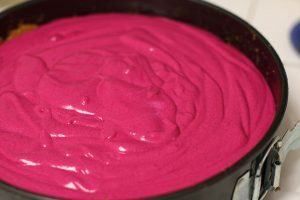 With practice or a steady hand, the best way (but not necessary) is to pour it between the rotating whisk and the wall of the bowl. Once you have finished adding the sugar, allow meringue to cool while whipping on medium-high until bowl is no longer steaming hot, approx 15m. Once the mixer bowl feels slightly warm or cool, but not hot, take out the butter from the fridge. Add a few cubes (3 or so) to take the warmth off of the meringue. Then slowly add the rest of the butter, 3 or so cubes at a time, until the cubes break down but don’t fully incorporate. If the butter is added too quickly, the buttercream will separate. Once all the butter is added, you will see the buttercream become thick and fluffy. Continue beating until smooth, approx 5m more. Use buttercream immediately or store wrapped tighly in plastic wrap. Double-wrapped preferably. Will last 2-3 weeks (depends on expiration of eggs) in fridge or 3 months in freezer. Decided to store for a later use? Whip refrigerated buttercream until smooth and creamy. It will appear curdled at first. This is normal and due to the cold temp. Let it whip 10-15m until smooth and emulsified. If you froze it, let thaw in fridge before whipping. Use buttercream to ice cakes, cupcakes, as a filling, in tarts, and anywhere else your imagination takes you. 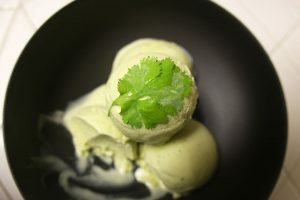 It’s much softer and lighter in taste, so it has more versatility. These little treats where amazing!! Just reading about them again makes me want more.